Unfortunately, the project partner that designed and built the hardware that mounted the EMAT system to the test train did not correctly account for the load the EMATs would place upon it. As a result, the EMATs suffered damage and ceased to function after only a short run. Some data was collected for a single run, but it cannot be relied upon, due to the way in which the EMATs were oscillating over a large distance and impacted onto the rail multiple times. Despite this, it was at least possible to detect the gaps in the rail, and these can be seen as gaps in the B-scan. The B-scan is an image that allows the variation in the signal captured to be very easily seen. The vertical axis represents the time that part of the signal arrived at the receiver relative to when it was emitted. The horizontal axis represents which capture the data corresponds to; captures were made at approximately a constant rate as the train moved, so the capture number is linked to the distance along the rail. The colour represents the relative size of the wave amplitude for that capture and relative point in time. This B-scan contains 2000 data captures, each showing the signals that arrived between 50 and 90 microseconds. No averaging was used when capturing this data. The emitter and receiver were 20cm apart. White vertical stripes in the B-scan are due to gaps in the rail. I-RAIL aims to develop an intelligent on-line high-speed rail condition monitoring system deployed via passenger and freight trains. 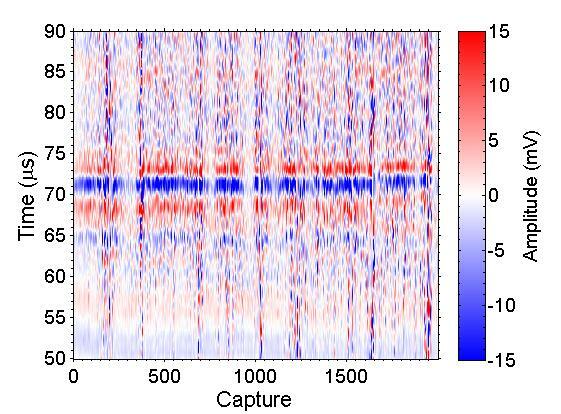 Rayleigh-like ultrasound waves generated and received by electromagnetic acoustic transducers (EMATs). These waves are confined to the surface, and are sensitive to surface defects. Surface defect depth can be quantified by analysing the Rayleigh-like wave attenuation caused by the defect. Simulations show limitations due to variations in defect size and position relative to the EMAT. Some data collected, but EMAT system rapidly destroyed due to failure of partner designed and constructed mounting system. Gaps in the rail are clear in the data, but any other information cannot be identified due to the failure of the mounting system.